Millets are gluten free and digetion friendly. Millets are nutritious, non-glutinous and easily digestible grains containing bundles of vitamins and minerals with complex carbohydrates providing good energy source. Millet savoury dumpling is a combination of millet with pulses and necessary add-ons which provides a completeness of breakfast. Start the day with a healthy breakfast ! Step 1: With every 1 measure of Ammae Millet Upma mix add 3 measure of water and add 2 spoons of oil. Step 2: Mix the ingredients well close the lid of the container. Step 3: Pressure cook for 5 whistles. After removing, add fresh cocunut grating and curry leaves for taste. 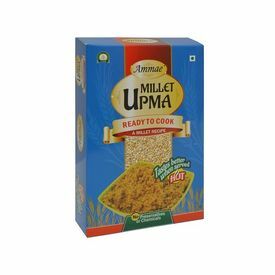 Millet Upma Traditional food with purely millets, without rice Net Weight : 150gms pack each - 2 packs as a Unit Best Before : 3 months from PackingMillets are gluten free and digetion friendly. Millets are nutritious, non-glutinous and easily digestible grains containing bundles of vitamins and minerals with complex carbohydrates providing good energy source. Millet savoury dumpling is a combination of millet with pulses and necessary add-ons which provides a completeness of breakfast. Start the day with a healthy breakfast ! Millet Upma, Simple preparation Prepartion time - 20 min Step 1: With every 1 measure of Ammae Millet Upma mix add 3 measure of water and add 2 spoons of oil. Step 2: Mix the ingredients well close the lid of the container. Step 3: Pressure cook for 5 whistles. After removing, add fresh cocunut grating and curry leaves for taste.